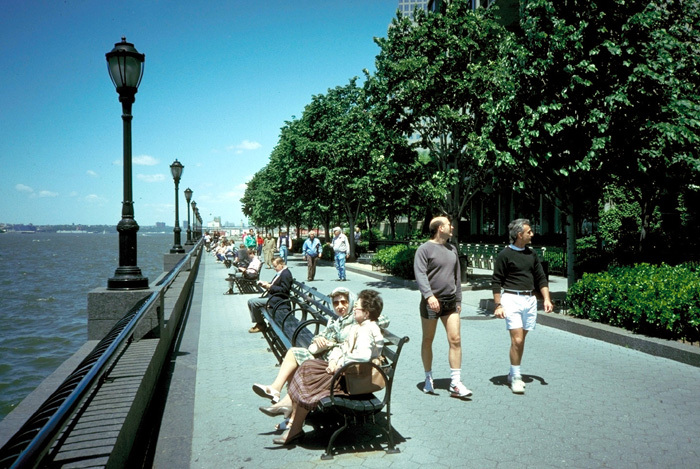 The Esplanade runs along the Hudson River for the entire length of Battery Park City and is lined with parks, gardens, and marinas - a pedestrian paradise. 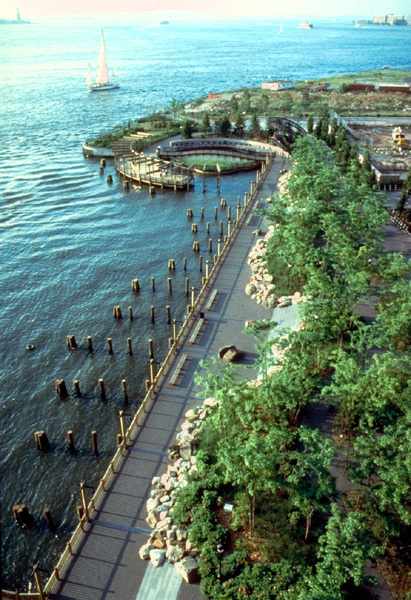 There are so many wonderful parts to this major addition to lower Manhattan that some of us would say it should be on our Great Public Space list... and maybe it should be. But it also has major drawbacks that we feel must be expressed. As a whole the development has enormous integrity. With the office in the middle with a grand plaza, an active waterfront, ferry service, a retail level, and a Winter Garden, the central area has all the components of a great place. To our way of thinking it doesnÍt quite come together. The retail level has never really connected to the rest of the area. It is hidden behind formal architectural facades that leave most visitors unaware of it presence. The outside plaza has poor edge uses that are compensated with outdoor restaurant seating, but there appears to be little connection to any of the indoor uses. Public use is quite limited. 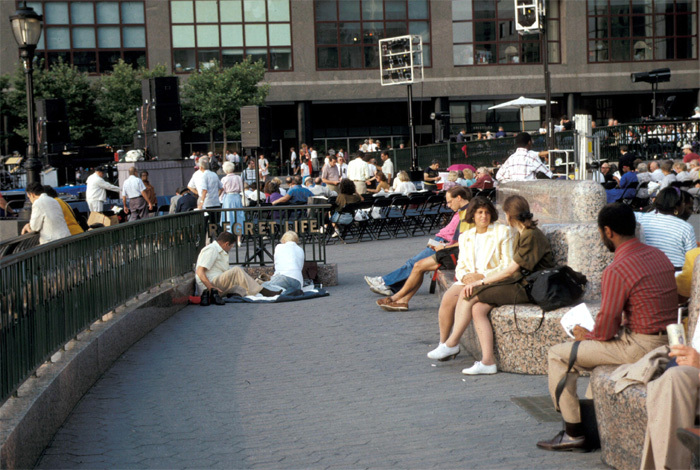 We have many pictures of people trying to use the limited seating available, and if you want to do anything else except stroll along through the plaza, there is little to do. The better examples of waterfront developments around the world, including Sydney Harbour, Granville Island in Vancouver, the Stockholm harbor and others exhibit more diverse qualities that are missing in this area. The southern residential area also has many positive qualities, but just misses in fundamental ways from being great. With only one restaurant in the whole stretch and small ineffectual focal points, the experience is merely just a nice walk. 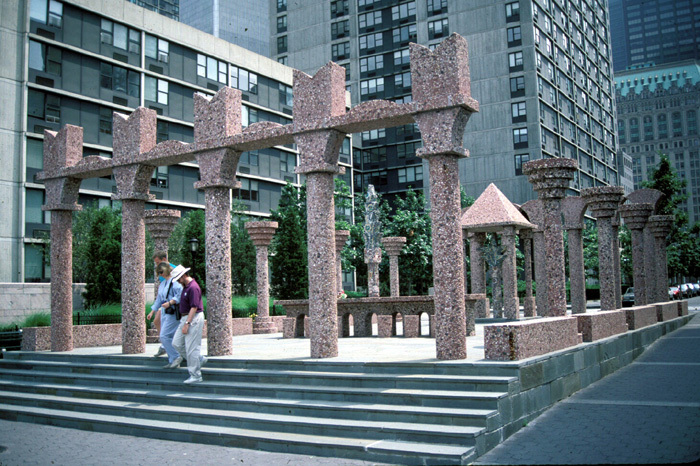 If the art, which is sometimes quite impressive, were more closely aligned along the promenade to create small nodes and there was a major focal point with perhaps a small seasonal caf_ with seating and telescopes instead of a clump of trees at the end of this part of the promenade, the experience would be a whole level higher. We also have a major problem with the natural area of rocks, trees and an overlook in the small harbor just south of the major residential area. Here again, the idea is intellectually interesting, "nature in the city", but it fails to accommodate basic human needs. If one has been to Mohonk Mountain House and seen the walkways with vistas and seating in a beautiful natural setting, one quickly sees that natural human activity such as sitting looking out over nice vistas is left out. In an urban setting, nature and human activity can go together quite well giving an elevated spiritual experience that would be better than sitting on a series of rocks trying to achieve some level of comfort. 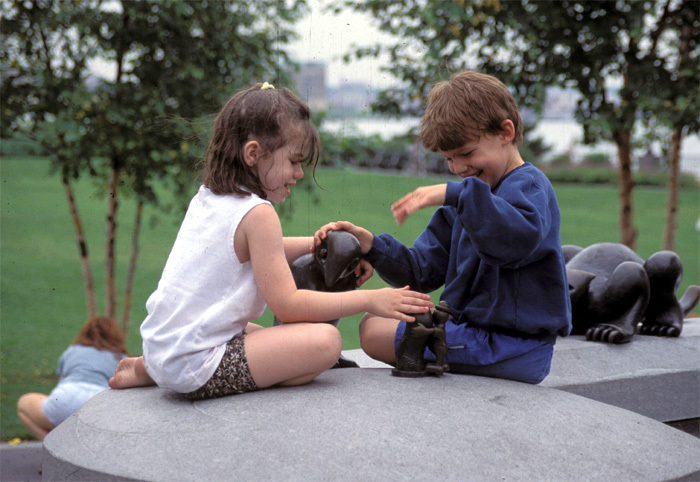 There is a walkway and bike path made out of concrete and granite pavers with bronze artwork, lights and railings. 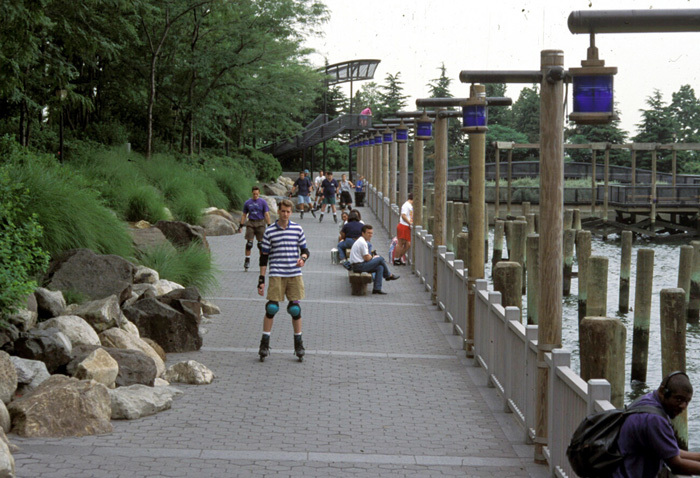 There are benches and physical activity areas that border the walkway, and beyond that on higher ground there is another walkway and bike path. There are small hills and ponds, all of which are beautifully landscaped. The park is usually impeccable, with a great mixture of people. A lot of sport activity such as soccer, biking, jogging, basketball, tennis, etc. The plantings are changed monthly during spring and summer, once in the fall, and once again in winter. The park serves many purposes. 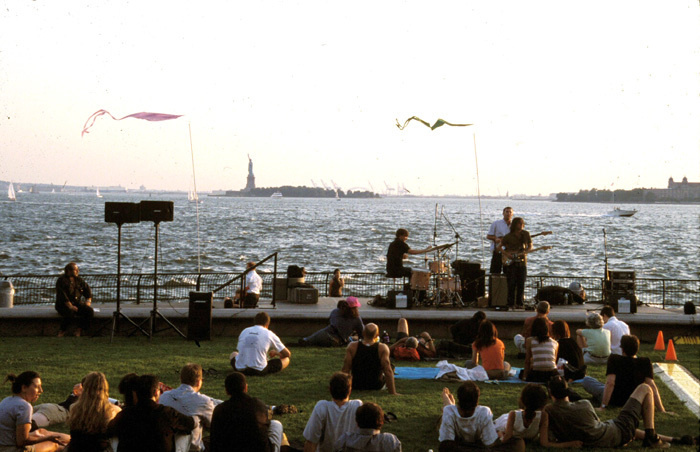 Sports, ferry service, public events, and sightseeing are among the many uses. People do often meet friends here, though some people also use the park by themselves to read, walk or relax. A wide range of people are represented here. 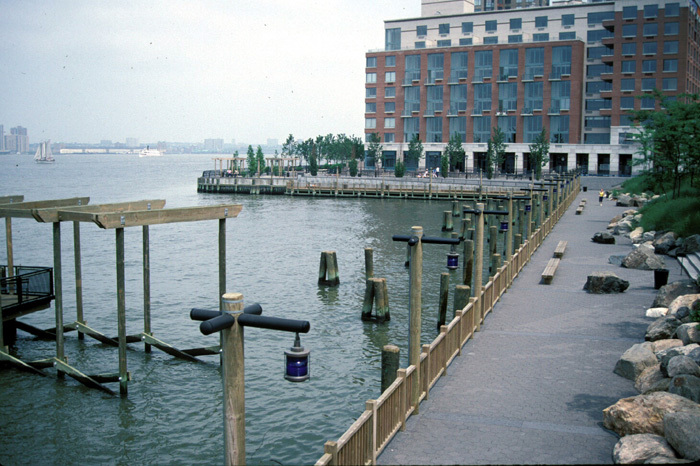 The condominiums built as the original Battery Park City were built on landfill. The esplanade park portion was very small and uninteresting. The condominiums failed to sell. At great expense, the city added additional landfill for the park. Now, despite the expense and failed beginnings, the development is touted as the most financially successful ever in NYC.